How Can I Avoid Having Financial Disputes in My Relationships and Marriage? January tends to be the busiest time of year for divorce, particularly for those of us who have dedicated our careers to helping people ensure that they remain protected throughout the process and can move on comfortably with their new lives. One common theme that seems to affect all couples—regardless of their marital status—stands out: money and assets is something that couples frequently argue over. Yet, there are ways of strategically setting up your relationship so as to avoid these types of arguments. As we approach the divorce ‘season,’ below, we offer some advice for those who are not yet married, already married, and/or already in the process of obtaining a divorce. There’s no question that ‘opposites attract,’ and this applies to money management in relationships and marriage. According to the experts, even if two people start out similar in terms of how they handle money, over time, they will often become opposites simply due to necessity and survival. There’s also no question that being transparent about accounts, assets, liabilities, income, debt, and spending is crucial when you come together as a couple because you are, to a certain extent, relying upon each other (whether that’s to pay rent, bills, a mortgage, etc.). All of this becomes especially important when second, third, and subsequent marriages are involved, and families are blended. This can breed resentment as children worry about their future and new partners may become frustrated with previous child-related expenses. 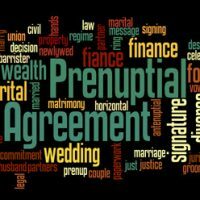 For these reasons, there is no question that a prenuptial agreement (for those who have not yet gotten married) or a postnuptial agreement (for those who are already married) is an important element of the relationship. Not only can agreements like these help make explicit what everyone can and cannot expect with respect to finances, but they can address many other issues that may be hanging over the relationship, such as how to deal with either partner’s pre existing debts. Parents can also help address tensions that arise from blended family issues by setting up a trust under a will to ensure that their children are taken care of. Reportedly, prenuptial agreements have been on a steady increase of late, especially when it comes to young couples. However, regardless of whether you are unmarried and thinking about co ownership of property with your partner/significant other, or already in the process of getting divorced and questioning whether you should, for example, hold onto the family home, seeking out the advice of an experienced family law attorney in your area is absolutely invaluable to make sure you aren’t making devastating mistakes in the process. If you live in Florida and have a family law-related question, the Arwani Law firm is your go-to. Our attorneys work around the clock to protect our clients in seeking prenuptial agreements, divorce decrees, child custody orders, and any other type of family law issue. Contact us today to find out how we can help you and your family.